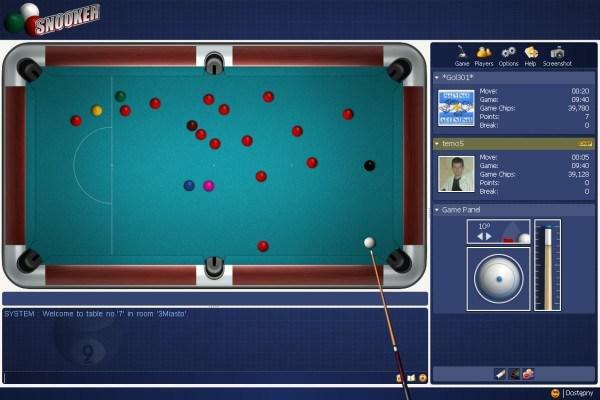 Snooker 2009 – game rules. 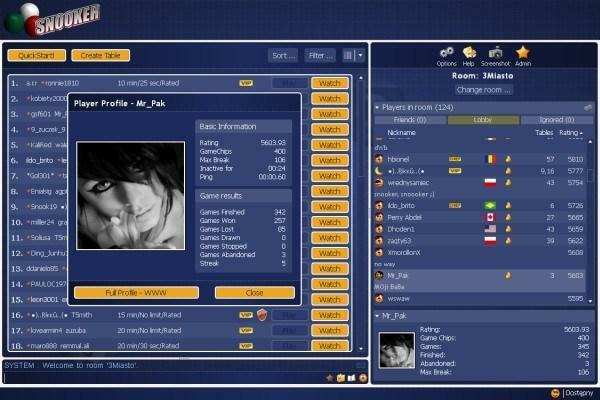 Hra – see how to play Snooker 2009 on GameDesire! Potopte koule ve správném pořadí. Porazte svého soupeře! Snooker is a two-player billiards game played using 15 solid red balls, a white cue ball, and six colored balls. Players alternate turns and score points by pocketing balls. Red balls are worth one point and each of the six colored balls has a different point value, ranging from two to seven points. At the end of the game, after all the balls have been pocketed, the player that has scored the most points wins. This is what the snooker table will look like at the start of the game, before any balls have been hit. Snooker is a game for two players. 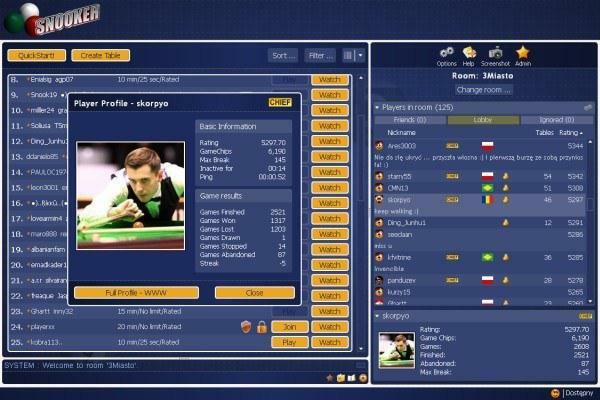 Like in other billiard games, snooker players alternate turns. If Player 1 makes his shot, he continues playing. If Player 1 misses his shot, he loses his turn and Player 2 gains the opportunity to shoot. If Player 1 commits a foul (even if he makes the shot), he loses his turn and Player 2 gains the opportunity to shoot. See the Fouls section for a list of fouls and their penalties. A snooker game can be thought of as having two phases. The basic rule of Phase One is that each player must alternate between pocketing the solid red balls and the colored balls. 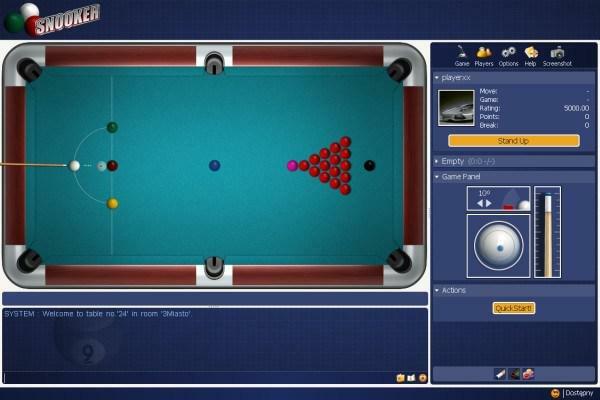 After the break, the player must pocket first any red ball, then any colored ball, then any red ball, then any colored ball, and so on, until all the balls on the table have been pocketed. Red, colored, red, colored, red, colored,…that’s the rhythm. The six colored balls are: yellow, green, brown, blue, pink, and black. After a red ball is pocketed, it stays in the pocket. But after a colored ball is pocketed, it is then automatically removed from the pocket and put back on the table. After all the reds on the table have been pocketed, the game rules change in two ways: 1. The colored balls are no longer put back on the table when pocketed and 2. The colored balls must now be pocketed in order according to their point value. In other words, first yellow, then green, then brown, then blue, then pink, then black. When the six colored balls have been pocketed, the game is over. The player that has accumulated the most points throughout the game wins. In Phase One (red balls are on the table), at the beginning of a player’s turn, he must first shoot for a red ball. In Phase Two (no red balls are on the table), at the beginning of a player’s turn, he must first shoot for the lowest value colored ball that is on the table. Each time a player is supposed to pocket a colored ball, the player must first designate which colored ball he will attempt to pocket. The player does NOT have to designate the pocket, only the ball. If the player subsequently pockets a ball other than the designated colored ball, a foul is committed. See the Foul section below for the associated penalties and for examples. If the player successfully and legally pockets the designated color ball, he will earn the points assigned to that ball. If the player is unable to pocket the designated colored ball but does not commit a foul, the player will simply lose his turn. It will then be the opposing player’s turn to shoot. Reds are never designated. If the player is supposed to pocket a red, he may pocket any red into any pocket. The player may also legally pocket multiple reds with the same stroke without incurring a penalty. B) the colored ball that the player has designated. If the cue ball first contacts with any ball other than the designated colored ball, a foul is committed. If the player is shooting for reds and the cue ball first contacts a non-red ball, a foul is committed. If a player is supposed to pocket a designated colored ball and does not pocket that ball, it is a foul, even if he pockets some other ball(s). The player loses his turn, gains no points, and the opposing player is awarded the point value of the designated color ball. If a player is supposed to pocket a red ball, and instead pockets a color, it is a foul. The player loses his turn, gains no points and the opposing player is awarded the point value of the pocketed colored ball. If a player who is shooting for reds pockets any colored ball (even if he also pockets a red) it is a foul. The player gains no points, loses his turn and the opposing player earns the number of points assigned to the color ball that was pocketed. If a player who is shooting for the designated colored ball pockets any other ball (even if he also pockets his designated colored ball) it is a foul. The player gains no points, loses his turn and the opposing player earns the number of points assigned to the color ball that was pocketed. For example: Player 1 has designated the yellow ball as the ball he will pocket. He instead pockets the blue ball. Player 1 gains no points and loses his turn. Player 2 is awarded 5 points (blue=5) for Player 1’s foul. For	the break, the white cue ball must be placed within the semi circle shown in the picture. You will be able to move the cue ball around only within the semi-circle. After being struck by the cue stick, the cue ball must first contact a red ball, otherwise it is a foul. The penalty for this foul is that the player loses his turn. As stated above in the Game Basics section, a player must alternate between pocketing reds and pocketing colored balls. When a player is supposed to pocket a red ball, the cue ball must first contact a red ball. If the cue ball contacts a colored ball first, a foul is committed and the player loses his turn. The opposing player will earn points for the ball that was illegally contacted. For example: It is Player 1’s turn and he is supposed to pocket a red ball. In attempting to pocket a red, the cue ball first comes in contact with the pink ball. The pink ball then contacts the red ball and only the red ball is pocketed. Because the pink ball was contacted first, Player 1 has committed a foul, even though he pocketed the red ball. Player 1 loses his turn and gains no points. Player 2 is awarded 6 points (pink=6) for the foul committed by Player 1. As stated above in the Game Basics section, a player must alternate between pocketing reds and pocketing colored balls. When a player is supposed to pocket a colored ball, the game will prompt him to designate the colored ball he wishes to pocket. The cue ball must first contact that designated colored ball. If the cue ball contacts a different colored ball first or a red ball first, a foul is committed and the player loses his turn (even if the designated colored ball was pocketed). The opposing player will earn points for the ball that was illegally contacted. For example: It is Player 1’s turn and he is supposed to pocket the green ball. The cue ball first comes in contact with a red ball. The red ball then contacts the green ball and the green ball is pocketed. Because the green ball was not contacted first, Player 1 has committed a foul and loses his turn, gaining no points. Player 2 is awarded 3 points (green=3) for the foul committed by Player 1. If,	after being struck by the cue stick, the cue ball does not contact any ball it is a foul. The player loses his turn and the opposing player is awarded four points. If the cue ball is pocketed (scratched) the player loses his turn and the opposing player is awarded four points. The cue ball is then removed from the pocket and given to the opposing player who can then place it anywhere within the semi-circle. If more than one foul occurs simultaneously, the opposing player is awarded points for the highest penalty foul. Penalty points are at least four points and at most seven points. The objective of the game is to earn as many points as possible. The black ball is the highest value ball, worth seven points. Hence, the best strategy is to try to pocket the black ball as often as possible. The ideal game would go something like this: Pocket a red ball, pocket the black ball, pocket a red ball, pocket the black ball, etc…until all the red balls have been pocketed.